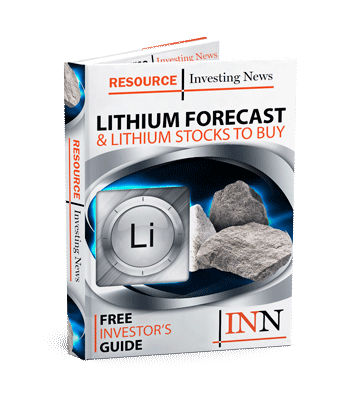 Interested in lithium-mining companies? Take a look at our list of the world’s top lithium producers by market cap. For a long time, most of the world’s lithium was produced by an oligopoly of producers often referred to as the “Big 3”: Albemarle (NYSE:ALB), Sociedad Quimica y Minera de Chile (NYSE:SQM) and FMC (NYSE:FMC). Rockwood Holdings was on that list too before it was acquired by Albemarle several years ago, making Albemarle that much bigger. However, the list of the world’s top lithium-mining companies has changed in recent years. The companies mentioned above still produce the majority of the world’s lithium, but China accounts for a large chunk of output as well. The Asian nation was the fourth-largest lithium-producing country in 2017 in terms of mine production, coming in behind Australia, Chile and Argentina. What’s more, Australia’s largest lithium mine, called Greenbushes, is majority controlled by China’s Tianqi Lithium (SZSE:002466). Tianqi owns a 51-percent stake in Talison Lithium, which runs the mine, while Albemarle owns a 49-percent stake in Talison via its acquisition of Rockwood Holdings. All in all, the market share for the “Big 3” lithium producers has dropped from about 85 percent to 53 percent, while China now has about 40 percent of the world’s market share. In the future, China is expected to fuel lithium-ion battery production, which is set to increase substantially in the coming years. In other words, lithium investors need to be keeping an eye on lithium-mining companies in China in addition to the New York-listed chemical companies that produce the material. Indeed, lithium expert Joe Lowry has written extensively about China’s rising share of the lithium market. As the landscape of lithium-mining companies continues to change, investors would do well to keep an eye on major players — Lowry has suggested that there could be an alliance forming as they try to ensure they are able to meet rising demand from the electric vehicle sector. Read on for an overview of the current top lithium-producing firms by market cap. Data was current as of August 13, 2018. SQM claims to be the world’s largest lithium producer, with offices in over 20 countries and customers in 110 nations across the globe. The firm has five business areas, ranging from lithium and derivatives to potassium to specialty plant nutrition. The lithium producer faced some challenges in 2015. It spent plenty of time butting heads with Chile’s Corfo over its leases in the Salar de Atacama, where the company’s lithium brine operations are located. After many failed meetings, SQM and Corfo came to a resolution in mid-January 2018. In 2016, SQM and Lithium Americas (TSX:WLC) announced they would develop the Cauchari-Olaroz lithium project in Argentina via a joint venture, marking SQM’s first investment in lithium outside of Chile. Two years later, Ganfeng purchased SQM’s stake in the project; according to Ganfeng and Lithium Americas, first production is still set to take place in 2020. Albemarle is one of the largest lithium producers in the world, employing 5,000 people and with customers in 100 different countries worldwide. Besides lithium, Albemarle produces bromine and provides refining solutions and chemistry services for pharmaceutical firms. When Albemarle closed its acquisition of Rockwood Holdings in early 2015, it became a heavyweight in the lithium space. The company owns lithium brine operations in the US and Chile and, as mentioned above, it owns a 49-percent stake in the massive hard-rock Greenbushes mine Australia. In March 2017, Albemarle announced plans to double production at Greenbushes. It’s expected that capacity will reach 1.34 million tonnes of lithium concentrate per year once a second production facility at Greenbushes is completed in 2019. A second expansion was announced in July 2018. Earlier in 2018, Albemarle announced that its request for an increase in its lithium quota had been approved by Corfo. The company is now authorized to produce up to 145,000 MT of lithium carbonate equivalent per year in Chile until 2043. FMC is the third-largest player on our top lithium-mining companies list. FMC operates its lithium business in the Salar del Hombre Muerto in Argentina. In October 2016, FMC signed a long-term lithium carbonate supply deal with Nemaska Lithium (TSX:NMX), wherein Nemaska will supply FMC with 8,000 MT of lithium carbonate per year, beginning in mid-2018. Lithium producer Tianqi Lithium is a subsidiary of Chengdu Tianqi Group, headquartered in China. It is the world’s largest hard-rock-based lithium producer. In 2012, Tianqi beat out Rockwood Holdings to take control of Talison Lithium, which controls the Greenbushes mine in Australia. However, it subsequently sold a 49-percent interest in Talison to Rockwood Holdings, which as mentioned is now owned by Albemarle. Tianqi paid $209.6 million for a 2.1-percent stake in SQM in September 2016. As noted above, two expansions are now in the works at Greenbushes. It is worth noting that Talison is currently in the midst of a court battle with Global Advanced Metals over those plans — the company owns the rights to tantalum and other minerals produced at Greenbushes, and has asked that any expansions be halted to ensure its rights are secure. In 2018, Tianqi boosted its interest in SQM, acquiring a 24-percent stake in the firm for $4.07 billion. The initial excitement from the news was dampened when it was revealed that the acquisition would be investigated by Chilean competition watchdog FNE. Jiangxi Ganfeng Lithium is another important Chinese lithium producer that investors should be keeping an eye on. The company is China’s second-largest lithium producer, and like Tianqi, Ganfeng is also buying up interests in lithium companies outside of China. It owns a 14.7-percent stake in lithium junior International Lithium (TSXV:ILC), and in July 2015 it signed a memorandum of understanding for an offtake agreement with Australia’s Reed Industrial Minerals, owned by Neometals (ASX:NMT) and Mineral Resources (ASX:MIN). What are your favorite lithium-mining companies? Tell us your thoughts in the comments. This is an updated version of an article originally published by the Investing News Network in 2016. Securities Disclosure: I, Amanda Kay, currently hold no direct investment interest in any company mentioned in this article. Editorial Disclosure: Nemaska Lithium is a client of the Investing News Network. This article is not paid-for content. …and just for the sake of completeness, let’s not forget Reed Resources (ASX: RDR) who intend on commencing operations in a few months time (early 2011) at an initial production rate of 32kt of lithium carbonate equivalent – which would put it in the top 4 producers of lithium in the world. Information on Galaxy is well out of date. mount Cattlin mine is currently closed. Treatment plant in China was built, closed and taken over by Tianqi. Mt. Cattlin is open again, renovated and brought to operational standard, their first shipments are expected in H1 2016. They signed a supply contract with Mitsubishi in 2015. Currently the only producing lithium companies are ALB/Tianqi (Tallison), Orocobre (Salar de Olaroz) and Galaxy (Mt Cattlin). Can you notice (and corrige if possible) that there is a little mistake in the second paragraph of this article? It is written that “China was the third-largest lithium-producing country last year in terms of mined production, according to the US Geological Survey, following Australia and China”. China can’t be the third producer after China. What happen’s with RB Energy? Ýou talk about Canade Lithium, but since Chapter 11 where are silence about them. Lithium producers in Portugal also exist because not speak Mines Portugal of lepidolite? Salt dome property for sale–177 acres atop the Butler Salt Dome in East Texas. Two huge caverns with estimated 650,000 barrels of saturated brine; disposal well off site, offices, normal surface support systems, huge fresh water reservoir, lined brine pond, etc. Excellent potential for Lithium extraction as caverns can be refilled several times. Contact Nancy Funderburk, President at email shown. I have a mining with 60 percent lithium in rock. I need a company to work jointly with me. Is their a video available on extracting lithium from rock on a commercial basis?? What about AIS ? Was supposed to start digging in Chili in 2018. Shares went down to almost nothing and no news on them.